In high school shop in Eagle Point, Ore., master clockmaker Ed Beacham spent a lot of time making boats to sail on the Rogue River. "The shop teacher wanted me to make something other than racing boats," Beacham says. "He told me my assignment would be to make a grandfather clock." To make his clocks, Beacham works out of two studios. In the back of his Sisters, Ore., store—Beacham’s Clock Company—he creates the movements and gears. “At the store, you can see clocks I’m working on as they’re under construction,” he says. “I put them on the walls to test them before they’re cased." He hand-builds the cases in a 2,000-square-foot shop near his home. Made from cherry and Circassian walnut burl, the case for this clock took more than 100 hours to craft. 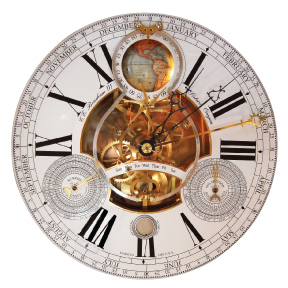 Beacham, who’s built more than 600 clocks, enjoys the techniques he uses to build each one. “I like the precision work, working with wood and the detailed handwork,” he says. Beacham’s E. Howard 67 Wall Clock sells for $25,000, but most of his clocks cost between $3,500 and $5,000. Contact clockmaker Ed Beacham at his store, Beacham’s Clock Company, (300 W. Hood St., 541-549-9971) in Sisters, Ore. To see more of his clocks, check out his website, beachamsclockco.com.